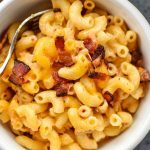 The ultimate comfort food with a twist – you will not believe this Kimchi Bacon Greek Yogurt Mac and Cheese is made with Greek yogurt! Make and take this impressive mac and cheese dish to your next potluck or eat the BEST leftovers at home all week! Cook the macaroni: Heat several quarts of water in a large stockpot over high heat, and cook noodles according to package directions until just barely al dente, the minimum cook time on the package. Drain and set aside in a strainer, adding a few drops of oil or cold water and stirring minimally to ensure they don’t stick together. Cook the bacon: Lay the bacon strips out horizontally on a cutting board, and then using a sharp chef’s knife, cut the bacon strips vertically into several small slices, small enough to be considered bacon bits (but they don’t have to be super tiny). Heat the same large stockpot over medium heat and add the raw bacon pieces. Cook for 9-11 minutes or until cooked through and beginning to crisp, stirring occasionally. Remove the pan from heat and remove all the bacon bits, leaving the bacon fat. Place the bacon bits in a paper towel lined bowl to absorb extra grease and set aside. At this point, preheat the oven to 450F. Make the cheese sauce: Place the large stock pot with bacon fat over low heat. You should have about 2 tablespoons of bacon fat, or enough to coat the bottom of the pan (no need to measure). If you think you have too much fat in the pan, remove a 1/2 tablespoon or so and continue. If you don’t have enough fat, add 1/2 tablespoon butter. Add flour to the pan and whisk continuously until the fat and flour have thickened (around 90 seconds). Add the milk, 1/4 cup at a time, whisking continuously until completely added. Let the milk heat for about 2 minutes, while you continue to whisk. Add cheese (reserve 1/3 cup for topping), and whisk continuously as it melts. Add greek yogurt, salt, and pepper, and continue to whisk until a smooth sauce has formed (about 1 minute). Remove from heat. Put it together: Add the cooked macaroni, kimchi, and bacon bits (save a few for topping) to the pot with the sauce. Stir until well-mixed. Pour everything into a lightly greased 9×13 inch casserole pan. Top with remaining cheese and bacon bits. Bake uncovered for 12-15 minutes until the cheese is bubbly and top is golden to your liking. Enjoy immediately or refrigerate and enjoy as leftover for up to 4 days. Make and refrigerate to cook later: Make the recipe up until just before the final baking stage. Cover with a lid or foil and refrigerate for up to 24 hours before baking. Bake in a 400F oven for 20-25 minutes or until the internal temperature reaches 160F and the cheese is bubbly. Make and freeze to cook later: I have NOT tried freezing this dish, however I do think it’s possible. Here’s what I would do to freeze this dish: Make the recipe up until just before the final baking stage in a freezer to oven safe dish. Let it cool completely, then cover with a lid or wrap tightly in foil and freeze for up to 2 months. Bake in a 350F oven for 55-65 minutes or until the internal temperature reaches 160F and the cheese is bubbly. Recipe adapted from Greek Yogurt Macaroni and Cheese from Tori Avey. Nutrition information estimated with MyFitnessPal.